Nature has be capricious in the Texoma region for the past few years, mixing torrential rains with extended periods of draught. The result has been a lot of dry ponds. Southwestern resourcefulness has once again proved equal to the task as new conservation and natural resource management methods have been implemented to make surface water in the region available for commercial and recreational purposes. 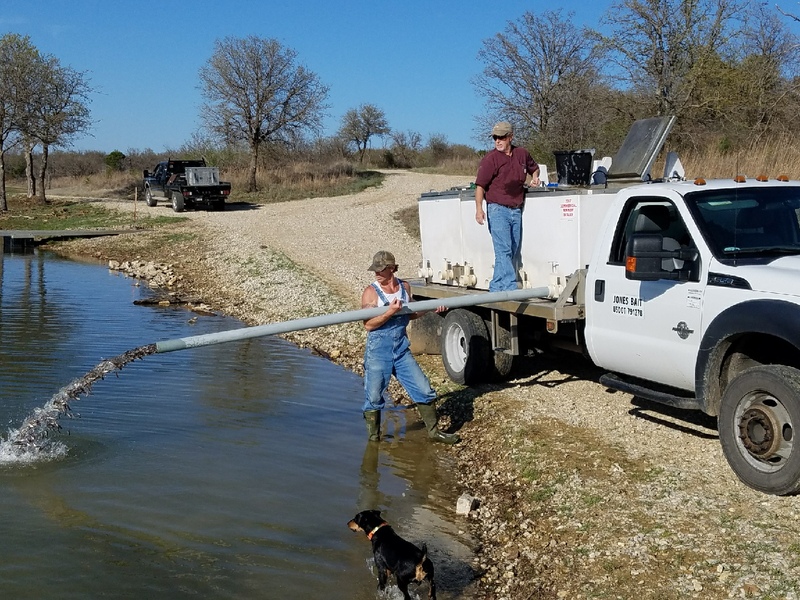 Whether you are digging a new pond or replenishing an existing one, the experts at Jones Wholesale Bait, Inc. stand ready to assist you with advice and experience as well as quality stock fish. We'll help you determine how many fish you need without over-extending your pond's capacity. Regardless of whether your taste runs from channel catfish to red ear sunfish, from black crappie to large mouth bass, or numerous other fish varieties, we'll make sure your pond is properly stocked with healthy, vigorous fish at a fair price.